There are some decent movies that are elevated by a truly spectacular performance. Take Reese Witherspoon in Wild, for example. Nightcrawler, on the other hand, is a great film that also happens to contain a career-defining performance by Jake Gyllenhaal as a Patrick Bateman-level sociopath. Surrounding his great work is a smart media satire wrapped up in a sleek LA noir. It has a complex character who is relatable because, like any of us, he lives through the Internet. Nightcrawler was a minor mainstream success, the kind that makes me hopeful for good ideas that can break through all of the noise. Best Scene: Lou (Gyllenhaal) takes network news director Nina Romina (Rene Russo) out to margaritas and then attempts to blackmail and seduce her. Bong Joon-ho’s Snowpiercer is one of the most original sci-fi films I have seen in a long time. Set on a train in a frozen, dystopian future, Snowpiercer displays its world in several different levels. It is kind of like Inception, minus the need to shake Christopher Nolan and shout, “EXPLAIN YOURSELF!” In a short amount of time and in a very small space, Snowpiercer develops an incredibly complex world. Sure, the ending might not be perfect, but how could you be so ungrateful after listening to Captain America deliver a monologue about eating babies? Snowpiercer embraces the weird in a way that similar films do not. Best Scene: The gang of rebels stumbles into a classroom where the teacher (Alison Pill) gives a spirited, propaganda-filled lesson about the history of the train. The wonderful weirdness of this scene makes me giddy on a level that I cannot properly explain. Speaking of embracing the weird, Paul Thomas Anderson took $20 million and decided he has earned the right to make whatever the hell he wants. The complicated mystery is weirdly freeing; the sooner you realize that nothing makes sense, the sooner you can kick back and enjoy this drug-filled romp. Inherent Vice is a cinephile’s paradise with a huge ensemble in which every cast member is at the top of their game. You might not expect it, given the film’s fascination with cults, but Inherent Vice is a crowd pleaser. However, it is a crowd pleaser made by Paul Thomas Anderson, so it is not for the faint at heart. However, if you don’t howl with laughter during the massage parlor scene, then you’re just a square who doesn’t deserve to be Doc Sportello’s compadre. Best Scene: Josh Brolin screams about pancakes in a Japanese diner. I don’t know why he is eating pancakes, and I don’t know why he can speak Japanese. Questions are stupid. Life is more fun when you stop questioning everything. Mark 2014 as the year Wes Anderson finally stopped listening to all of your complaints. Like anything Wes Anderson puts his paws on, The Grand Budapest Hotel looks like a painting in motion. It mixes a Candyland aesthetic with a stern examination of fascism. The bright colors and charming characters will throw you off every time a severed finger or head pops up. Sure, you could accuse Wes Anderson of being shallow. However, you can never say that he isn’t willing to try something new. Best Scene: While on a train (not Snowpiercer), Monsieur Gustave makes one last stand against the fascists that have taken over his beloved country. This whole film was a 90 minute buildup to this one emotional moment. I am sick and tired of people who put Guardians down just because it is merely entertaining. A film that is as entertaining as Guardians of the Galaxy is deserves to be mentioned alongside all of the possible Best Picture contenders. James Gunn didn’t make something that winked at the camera. All he did was create a straightforward action movie that might be as close as we will ever get to a modern Raiders of the Lost Ark or A New Hope. That’s right, bring on the mob, nerds! Anyway, I cannot wait to make a second trip into this beautifully realized galaxy. Best Scene: Groot makes the ultimate sacrifice for his friends. This giant tree has only said three words and yet I feel more connected to it than a lot of other characters that are supposed to be fleshed out a lot better. The smartest mainstream film of the year is Gone Girl. I walked into this one knowing very little about the story, so the twists took me completely by surprise, and added to my enjoyment of the film. Yet, I have talked to many people who worship Gillian Flynn’s novel and still love this film. While the grand twist brings the film to another level, the story does not rely on it, so Gone Girl will not go the way of The Sixth Sense, which is the psychological thriller’s equivalent of the Dodo Bird. What Gone Girl does rely on is a cast of actors ranging from Ben Affleck to Rosamund Pike to Tyler Perry who all do the best work of their careers. They are led at the helm by David Fincher, who is outstanding when it comes to making social satire that is as frighteningly true as it is funny. Sadly, this might be the last film in a very long time that both grosses over $165 million and triggers heated discussions about gender roles in society. Best Scene: Amy Dunne’s plan comes to light. The Lego Movie is the kind of thing that would normally make most critics want to grab their torches and pitchforks over. It turns out the second best pop culture critique of the year is based on one of the best toys out there (and screw you, squares, Legos aren’t just for kids). This is meta that the whole family can enjoy. Phil Lord and Chris Miller’s action comedy manages to make fun of everything we love, and then in the end, give us a reason to love it again. Sure, a lot of people say that Hollywood is out of ideas. But just because something is based on an existing property, that doesn’t mean that it isn’t original. Best Scene: Everything Is Awesome. Birdman is one of the most insane and widely discussed films of the year, and for good reason. Rarely have I seen a likely Best Picture nominee contain a joke where Ed Norton gets a stiffy while performing in a Broadway show. Birdman has a lot to say and it does so in a collection of elegant monologues and a breathtaking tracking shot that never ends. This is where you go if you want to see Emma Stone explain the universe and Michael Keaton try to figure out the meaning of life while running around Times Square in his underwear. Alejandro Inarritu has finally found a way to be taken more seriously: by making the best comedy of the year. Best Scene: Can I just say that it’s all one scene so I don’t have to choose? Okay, fine, if you insist. Watching Ed Norton throw a tantrum because somebody switched out his gin is a lot of fun to watch. What can I say about Boyhood that hasn’t already been said by every man, woman, and film critic (film critics come from a planet where gender doesn’t exist, duh)? It is hard to come up with an original thought about this film. Everybody seems to have such a personal connection to Boyhood. Watching a boy grow up, experience pop culture milestones, try to figure out who he is, and then make his mom sad that he is leaving for college is something that most of us experience. Maybe that is the subtle beauty of Boyhood: it reminds us that we are not alone. That is what good art is supposed to do: remind us that we are all loosely connected through something that is ultimately intangible. There’s a little something for your Oscar speech, Linklater. Best Scene: Patricia Arquette’s final scene still fills me with melancholy each time it crosses my neurological paths. Whiplash isn’t normally the kind of film I might pick for this spot. It isn’t very funny, nor is it laced with movie references or exploding heads. But the minute the credits rolled, I just knew this had to be my top pick. If you are really into a movie, you love it both because it is objectively a good movie, and because it strikes you somewhere deep down, and stirs up some feelings you didn’t know were there. Thanks to the breathless directing by Damien Chazelle, Whiplash brings you deep into a world that you probably thought you didn’t have any interest in. Everything here becomes interesting to us, even watching somebody empty the spit valve from their trumpet. What is success? That is what everybody in Whiplash wants to know. It gives you an answer but look closely and you will see that there is more. Sure, it is easy to say that Fletcher is the villain here. But just look at Andrew, who has the face of a nice, timid boy, but a soul that grows blacker as the film goes on. He alienates his family and then dumps his girlfriend (who, for the record, I would totally date) because he aspires to be like a talented musician who died from a heroin overdose. I understand. I have a lot of insane goals. At different points in my life, I have had both John Belushi and Lou Reed posters. Troubled, creative people are usually the most interesting kind. Their work should inspire us, but we shouldn’t necessarily aspire to be them. 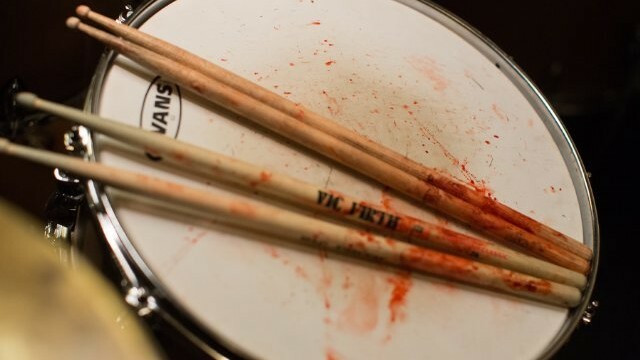 Whiplash is filled with a lot of complicated motives. It makes a monster relatable and a normal kid into a monster. It is scarier than most horror films, because the monster is selfishly ambitious. But then again, Andrew Neiman is one hell of a drummer. Best Scene: The final performance. I almost passed out from raw nerves. Totally my tempo.